Students at Dowling Urban Environmental Magnet School in Minneapolis use a model and spray bottle to simulate the role of rain in the Mississippi River watershed. FMR offers a variety of indoor and outdoor programs to support educators and outings leaders who want to connect their students or group members with the Mississippi River, each designed to address state academic standards. We offer 1-hour indoor programs and 1.5-2-hour outdoor programs. Indoor programs can take place at your meeting site, are free and have all supplies provided by FMR and our funders. This program begins with a brief discussion of the water cycle and how water moves through earth systems. It continues on to cover watersheds and how human impact both the land and our waters. Small groups build their own model landscape, hypothesize how water and pollution will flow upon it and then test their hypothesis. We conclude with a wrap-up on what we can all do to keep our waters clean in our everyday lives. After a short review of ecosystems and how everything is interconnected, we'll discuss the difference between native and invasive species, how humans introduced them locally, and the social, ecological, and economic impacts of these new species. A brief game illustrates how invasives can take over an area (this can be done as a demonstration if students with physical disabilities are involved). We conclude with a discussion on ways to control invasives and what students can do to help. Focusing on the importance of wetlands to people and the environment, we begin by covering some different types of wetlands in Minnesota. Small groups then build a model wetland, watch it work and then pollute it to see observe potential human impacts. We conclude with a discussion about how well our models reflect the real world and what they teach us about managing our natural resources. We begin with a short puppet skit acted by willing students and narrated by FMR staff about the problems with erosion and its effects on our water. Next, we explore reasons people are now noticing more erosion and what we can do to prevent it. As a group, we'll use yarn to compare the startling difference between the native plants' root systems (a key tool in the fight against erosion) and spindly turf grass roots. The Mississippi River used to be a small river flowing into the Great Warren. We'll explore how erosion changed the river and our landscape to what it is today. Small groups will then work with a model landscape and water to see how erosion occurs and experiment with ways we can prevent it in sensitive areas. To wrap up, we'll look at keys to preventing stream-bank erosion and examples of what's being done in local restoration projects. 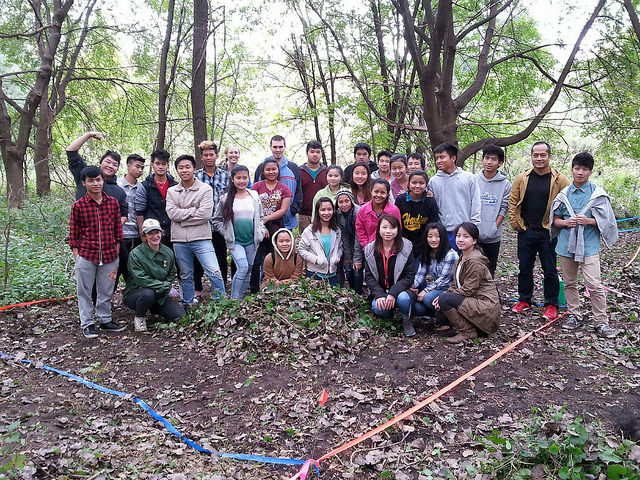 Harding High Earth Club, a long-time FMR partner, is helping to remove invasive species and restore a native hardwood forest and other East Side St. Paul restoration sites. Outdoor programs either take place at your meeting site or an FMR restoration area, depending on the program. They're free and all supplies are provided by FMR and our funders, though your group may need to supply transportation. After a brief educational presentation, we'll take to the streets to mark storm drains with messages about how each connects to the river. This activity can take place on the streets and sidewalks around a meeting location of your choice or select areas of Minneapolis. Weather permitting, stenciling starts late-April and continues through October. Learn more and sign up your group! Choose a park or green space around your meeting location or along the river to conduct a trash clean up. FMR will provide all supplies and a short educational lesson as an introduction. Student groups can help restore several FMR restoration areas in the metro area by removing invasive species. This can include hand-pulling garlic mustard or buckthorn, or hauling sticks and small logs of invasive woody species precut by specialty contractors. We highly recommend the 1-hour class on invasive species prior to the outing to provide context and familiarize participants with the site they will be restoring and the plants they will be removing. Visit an FMR habitat restoration site to learn about our ecosystem, the history of the site and ways we have used the Mississippi River in the past. Add a trash pickup or invasive species pull (see above) to help protect the site and become part of its story.